'Paid-for' London Times the future of online newspapers? The Times and Sunday Times newspaper sites are offering a free trial period for customers. London, England (CNN) -- Rupert Murdoch's venerable Times and Sunday Times newspapers launched their new-look Web sites Wednesday, as they prepare to start charging users for their content -- a move which could determine the future course of the ailing newspaper industry. The new sites -- thetimes.co.uk and sundaytimes.co.uk -- will replace the existing Times Online service, which incorporates content from both print titles free of charge. According to News International, which owns the two British newspapers, the sites' homepages will be freely available. But going beyond this point will require an online subscription of £1 ($1.43) a day, or £2 ($2.87) per week for access to both sites. This "paywall" will begin in June, it said. Last year Murdoch, chairman and CEO of News International's parent company News Corp., said the current free access business model favored by most content providers was flawed and contributed to a fall in newspapers' revenues. "We are now in the midst of an epochal debate over the value of content and it is clear to many newspapers that the current model is malfunctioning," he said. Video: No News Corp stories on Google? Murdoch said the experience of the News Corp.-owned Wall Street Journal had proved that charging for content could be made to work. He said 360,000 people had downloaded an iPhone WSJ application in three weeks. Users would soon be made to pay "handsomely" for accessing WSJ content, he added. The media tycoon has also repeatedly threatened to pull his company's news Web sites from Google and put all company sites that are currently free behind a pay wall. 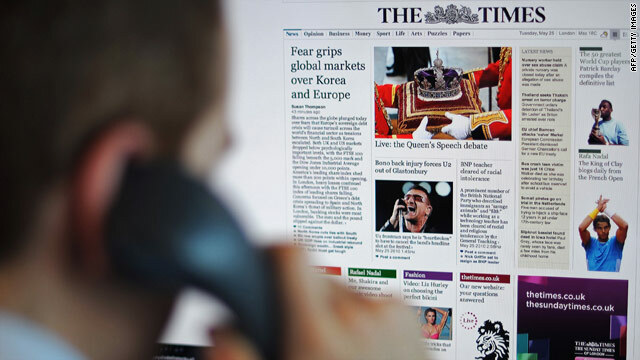 The only other major British newspaper currently charging for online content is the Financial Times, which charges a basic rate of £3.29 ($4.90) a week for a year-long subscription. Users can view up to 10 online articles for free each month, but they must register. However the FT's own digital media correspondent Tim Bradshaw said there are already doubts about the success of the paid-for plan. In its Alphaville blog he recently wrote: "The wide availability of free news online has led many to question whether paywalls can attract substantial numbers of customers." "What we're losing in volume we're hoping to gain in greater value per subscriber. News International admits it expects to lose an estimated 90 percent of its online readership -- though it said many of these people are "drive by" users who come in once or twice via Google News or other aggregators and don't really engage with the product. "What we're losing in volume we're hoping to gain in greater value per subscriber," a spokeswoman for the company told CNN. "We're unashamed to say we think the journalism we produce has got value." She pointed to the fact it charges for this professional content in print and cannot afford to keep "giving it away" on their digital platform as more and more people consume their information this way. "There's no indication that advertising alone will support this service," she added. Justin Pearce of leading online industry magazine, New Media Age, was cautiously upbeat about the move. "It's a brave decision," he told CNN "They'll be left with perhaps five percent of their traffic. But five percent of their online users paying is a lot of money. "Another argument is that if people pay to use your site, then they'll be more loyal and engaged readers. Therefore they'll be more valuable to advertisers, allowing advertising rates to be raised." He also pointed out that News International could sell their range of products as a bundle in the same way UK broadcaster BSkyB -- also part of the Murdoch media empire -- offers telephone, broadband and TV programs on one bill. "People won't notice an extra couple of pounds added on for newspapers each month," he added. But he warned the paid-for model may not be the silver bullet for all newspapers looking to stem their losses. "It'll be difficult for many newspapers to follow this, aside from niche products such as the Financial Times and trade magazines." News International said its other tabloid titles, The Sun and The News of the World, will begin charging for their online content later this year.